This paper addresses the issue of removal of endotoxin from biological preparations. Specific reference will be made to a novel sytnthetic ligand affinity adsorbent, EtoxiClear™. 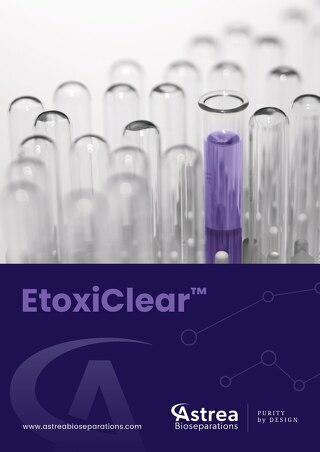 Etoxiclear™ is a high performance, non ion-exchange, synthetic affinity chromatography adsorbent allowing cost effective and efficient endotoxin removal. Available as an adsorbent slurry for column packing and in an extensive range of disposable columns to suit your process. Etoxiclear™ adsorbent comprises a novel synthetic chemical bi-dentate ligand derived from PBL’s Mimetic Ligand™ technology and is coupled to our proprietary PuraBead® 6XL base matrix which binds in a spatially selective and optimal manner to the LPS molecule.